Getting down to the studs: preserving the bones of a thing, maintaining a foundation and building something beautiful on top of it. It’s an approach I first heard Paul Gregutt espouse when discussing Waitsburg Cottages, the century-old houses he and his wife, Karen, have purchased, refurbished and rented out in the formerly sleepy, now-buzzing hamlet of Waitsburg (reached via a 20-minute drive through the wheat fields north of Walla Walla). And it applies equally well to Gregutt’s newest project, Waitsburg Cellars. The winery is a collaboration between Gregutt and Precept Wine, and it represents a new direction for the longtime wine scribe. Gregutt has served as the Northwest regional editor and reviewer for Wine Enthusiast magazine since 1998, and wrote the “Wine Adviser” column in The Seattle Times from 2002 until April of this year. His book, Washington Wines and Wineries: The Essential Guide, is considered a definitive resource. 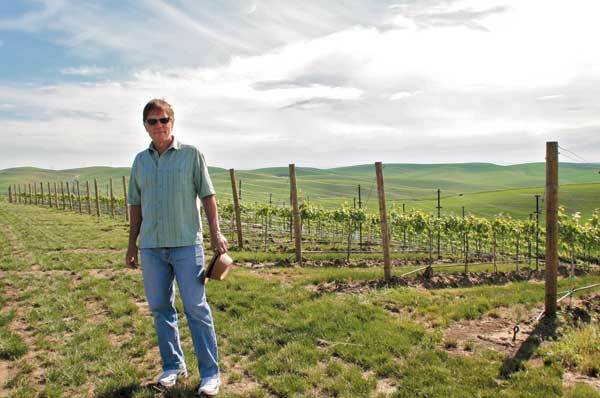 Gregutt was an education partner for Precept, the largest privately owned wine company in the Pacific Northwest, when it approached him about Waitsburg Cellars. With its wines distributed to far-flung corners of the country, Precept would, on occasion, fly its distributors and retailers to Washington, where Gregutt would teach them about the history and state of Northwest winemaking. Founded in 2003 by several of the players who grew Columbia Winery into Corus Brands before selling to Constellation in 2001, Precept has grown rapidly, absorbing vineyards (such as Alder Ridge, Canoe Ridge, Willow Crest) and brands (low- to mid-shelf grocery-store values such as Waterbrook, Sagelands and House Wine; and a handful of prestige brands (such as Browne Family) along the way. Rarely does the food critic don a chef’s toque, or the film critic take over the director’s chair. But the wine trade in the Northwest is a different animal—small and interconnected. To wit: I have sold Paul Gregutt’s books, and I have sold his Waitsburg Cellars wines to my mailing list. He has written about Full Pull Wines (my business) for The Seattle Times, and he has played his guitar in the Full Pull warehouse. I have no financial interest in any of Gregutt’s ventures, nor does he in any of mine, but these kinds of soft interweavings are difficult to avoid in our little cottage industry. Similarly, getting involved in a winemaking project was another weave for Gregutt, but the opportunity was too appealing to pass up. Precept offered Gregutt access to its “big box of crayons,” as Gregutt describes its acres of Washington vineyards and tanks and barrels of juice. The first two crayons he chose were shades of the same color: old-vine Chenin Blanc (one done in a dry style, the other off-dry). Some of the oldest vines still in production in Washington are Chenin Blanc, and Gregutt noted that a Hogue Chenin Blanc was a fond memory in his early realization that Washington was a special place for winegrowing. Sadly, a lot of that old-vine Chenin is now being ripped out and replaced with more fashionable varieties, so any project that keeps those old Chenin vines in the ground is worthy of support. The remainder of the inaugural Waitsburg Cellars release—produced out of Precept’s Canoe Ridge winery and Waterbrook winery (near Walla Walla) and Willow Crest winery (outside of Prosser) —includes a Pinot Gris, a Riesling and an intriguing red blend called “Three,” made from Merlot, Malbec and Mourvèdre. Gregutt knew what “Three” should taste like before he tried a sample. He has tasted broadly enough to picture a blend in his mind and then use the raw materials on hand to achieve that vision. The name is a play on Savennières, the great Chenin Blanc–producing region of Loire Valley in France. From Upland Vineyards on Snipes Mountain, it is the drier of the two Chenins, and it offers a rich, full mouthful of honeyed melon, apple and honeysuckle, dusted with malt powder. Pairs with: A creamy crab bisque. The core of this is Merlot (64 percent) from Canoe Ridge Vineyard, one of the gems of the Precept portfolio. It’s rounded out with 20 percent Malbec and 16 percent Mourvèdre. The latter two assert themselves on the nose, adding cooling minerality (Malbec) and leathery spice (Mourvèdre) to balance the Merlot’s luscious red cherry fruit. Three embraces the energy of the colder, acid-driven 2011 vintage, and the flavors of red currant and espresso dance across the palate. This is eminently gluggable. Pairs with: Coq au vin. Seventy-five miles east of Savennières is the Loire Valley’s other Chenin treasure, Vouvray, the source of the wordplay for this wine’s name. An off-dry version of Chenin Blanc, this comes from the same vineyard as the Cheninières, but Chevray was raised in neutral barrels; Cheninières in French oak. Autumnal aromas of musky apple give way to a palate with a kiss of sweetness to the apple and pear flavors. There’s plenty of mouthwatering acid to balance the sugar, and an alluring crepuscular character. Pairs with: Panko-dipped, pan-fried oysters. A Pinot Gris from Minick Vineyard, in Yakima, raised entirely in stainless steel to preserve delicate aromatics (white flowers and caramel-dipped apples) and fruit freshness. This, too, drinks off-dry, with light, honeyed sweetness to the fruit flavors of apple and cantaloupe. It has fine sugar-acid balance and intensity to spare. Pairs with: Apple- and breadcrumb-stuffed pork chops. Gregutt is calling his series of whites “The Aromatics,” and no wine in the lineup better personifies the name. Soaring notes of orange blossom, tangerine and lime zest come spilling out of the glass, followed by a brisk, acid-driven, low-alcohol (11.2 percent) mouthful that pulses across the palate. An ethereal treat. Pairs with: Chicken with panang curry.